Bring accuracy and ease to your SpO2 monitoring with the Veridian Healthcare Pediatric Pulse Oximeter. This compact oximeter fits on your little one's finger to measure his or her oxygen saturation of arterial hemoglobin and pulse rate in a non-invasive way. Meanwhile, the dual-color LED display has two orientation modes, making it easy to read the blood-oxygen saturation, pulse rate and pulse bar measurements. The Finger Tip Pulse Oximeter is effective and easy to use. It has a large, easy to read LED display and a two-way screen display. It monitors oxygen saturation of the user's hemoglobin and reads the user's pulse. It also features an automatic power off when the finger has been removed for 8 seconds or longer. 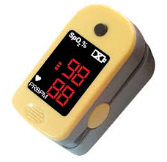 The pulse oximeter includes a rubber cover and has a three year warranty. We're adding more items every day. Please check back for new items soon.